You'll save $946 on this entire bundle ... that's 49% off! Save on Your Career Training! Getting 49% off these time-proven courses is huge, but the most important savings will come in the reduced flight time necessary to reach your goals. $1921 $975 ... 49% off! With this Career Pilot Online Training Bundle, you’ll be fully prepared for each flying lesson from Private through Flight Instructor and Multiengine, and for all the associated written and practical exams you will take on your way to becoming a Pro. Regardless of where you are training and what is included, KING prep courses will always give you an edge. No other courses simplify and clarify complex subjects like KING—and we make it fun! It’s like hiring a private tutor to get you through those tough aviation subjects. We have enhanced this bundle by including the KING Online Aviation Library to enhance your learning experience. The KING Library includes over 85 resources that you have lifetime access to and are always up-to-date! NEW! Includes a free iPad and iPhone King Schools Companion app that connects to your King Schools Online Video Courses (not available with disc courses), and allows you to download course videos so that they can be watched at any time, with or without an Internet connection. For complete information click here, or search “King Schools Companion” in the App Store. Since KING constantly updates the online courses with changes from the FAA, they are guaranteed to be ready when you are, with the most current knowledge that perfectly matching the associated FAA test. And You Keep the Courses—Forever! As you move through each milestone, you will want to have great references from past training. With books and most training material from other companies, there is no guarantee that they will still be usable—there could be major changes from the FAA at any time. In fact, many folks end up having to repurchase materials during their flying career. With KING courses, you not only have access to all online courses you have taken in the past, you also have our guarantee that they will be up-to-date with the latest knowledge requirements. This Career Bundle is only available with online courses. The free King Schools Companion app allows you to download and view the video lessons contained in your King Schools Ground School & Test Prep Course (written test course) when not connected to the Internet. This free app is available through the iTunes App Store by searching for "King Schools Companion." 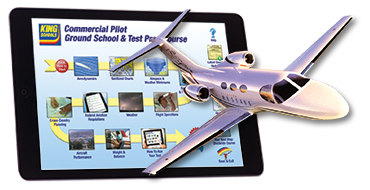 You should know the purpose of all our Ground School & Test Prep courses is to help you understand principles and concepts the FAA wants you to know and use as a pilot. Where possible, we use actual FAA questions in our courses to let you see how the FAA may test you on a subject. We know that if you understand the underlying concept, you should be able to answer any question about the subject. The FAA wants you to be able to think as a pilot— not just feedback memorized information when you take the test. For that reason, as of June 2009, the FAA ceased releasing all test banks to the public. This includes King Schools as well as all other companies that provide similar aviation knowledge courses. You have a big advantage with KING because we preserved our database, so we are able to offer to you the questions and explanations which contain the last full test bank that was available from the FAA. Most of the test questions never change because information on aerodynamics, weather and many procedures are constant. What does change are things like regulations and flight operations issues, so we review those changes by the FAA and create sample questions for you to study. We do this in several ways. When the FAA adds new or revised material to the references they use to derive test questions, we know that soon there will be some new questions on the test. Also, when there is a spectacular accident such as Colgan Air in Buffalo, the investigation results showing the probable cause of an accident will eventually result in some new questions. You'll want to start with the private pilot course materials and work your way through each certification/rating. The courses combined contain over 70 hours of video instruction. King Schools courses are self-paced so completion time for each course will vary from person to person. King Schools Ground School & Test Prep courses contain a text question explanation icon that contains a thorough explanation of the test questions. Click on the icon when you are in the question review that follows each lesson segment and you will have a pop-up window containing a thorough explanation of the test question.